SAW051739 SCOTLAND (1953). 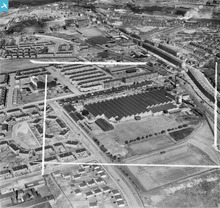 Glasgow, general view, showing Macfarlane, Lang and Co. Victoria Biscuit Works, Clydeford Drive and Tolcross Road. An oblique aerial photograph taken facing north. This image has been produced from a crop marked negative. Title [SAW051739] Glasgow, general view, showing Macfarlane, Lang and Co. Victoria Biscuit Works, Clydeford Drive and Tolcross Road. An oblique aerial photograph taken facing north. This image has been produced from a crop marked negative. Newspaper report to accompany picture below. Picture taken in 1933 (Tavern on the right, next to tram depot). The panic seen on the street apparently was a gang fight, of which Glasgow had more than their fair share of. On the brighter side the wee guy that owned the "bunnet" shop must have been "rolling in it". Quarrybrae School Annexe and sometimes dinner school. Tollcross Rd at Sorby Street. 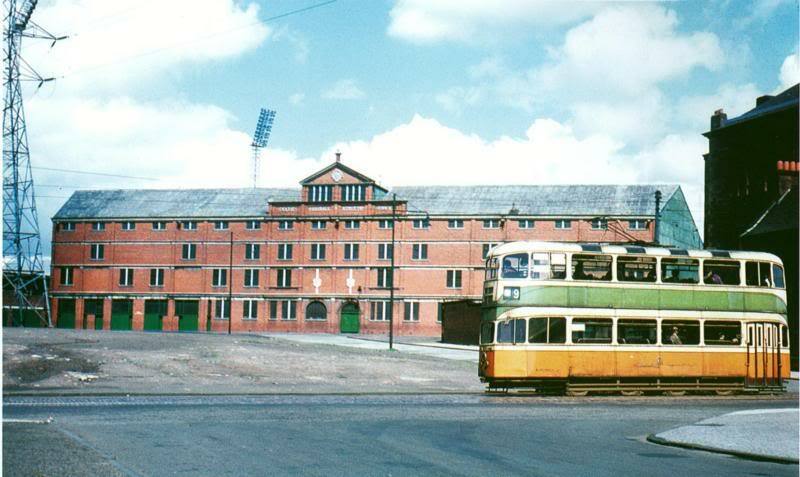 Helenslea Park, home of Parkhead Juniors F.C. (Founded 1880 ~ Defunct 1963). Parkhead's first ground was at the Sheddens where Old Shettleston Road and Shettleston Road meet. 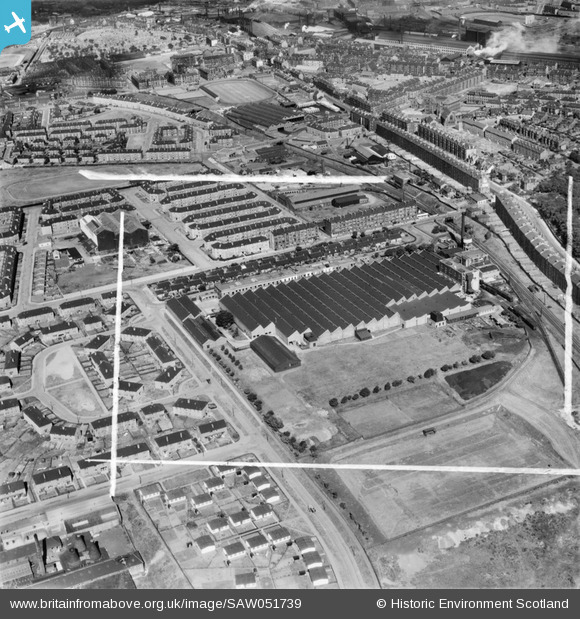 They then moved to Powfoot Street/Beattock Street and their ground was known as Helenslea Park, although they were known to have played some games at Helenvale Park. They were at one time the oldest team in the Scottish Junior League. Their third and final ground was once again named Helenslea Park and was located at Cuthelton Street. The club became defunct in 1964. City Bakeries, along with many bakeries, no doubt all over the U.K. they sold "German Biscuits", but the name was changed to "Empire Biscuits" during WWI. Wonder why? I found that interesting anyway, lol. Tenements opposite the depot were known as "The Scabby Loan" due to the fact they were completed by "scab labour" during an industrial dispute. The Duke of York, the future King George VI, laying a wreath at the war memorial at the Parkhead tram depot, early 1920s. Granada: 1317 Duke Street opened in 1935.Design by Lennox & McMath, seating capacity of 2400. Remained as a cinema until 1972 then it became a bingo hall. Closed in 1995, later demolished. Site was previously that of the Louvre Cinema, which dated from 1914 and could seat just under one thousand patrons. Black Cat Cinema : Sited at 830 Springfield Road, it was opened in 1921 as a cinema by the eccentric A E Pickard, a well known Glasgow theatre owner. It could hold up to 900 patrons and was later acquired by the BBC. It was used as a scenery workshop and also used as an occasional studio, transmitting ‘The White Heather Club’. Recreation ground at Helenvale Street Opened 2nd September 1924. The Duke of York (later King George VI) performed the opening ceremony, and kicked off a match between Glasgow Rangers and Partick Thistle. The Score was Partick Thistle 1 (Collins) Rangers 6 (Archibald 2, Henderson 4). Parkhead Picture Place, opened August 1921 at 49 Tollcross Rd The "3 Ps" as it was known was initally an upmarket cinema. Destroyed by fire August 1960. The Grapes, once called St. Kentigern's (Tollcross Rd.) There's been a pub on this site since 1878. Been shut for a few years now. Original Helenslea Park (Parkhead Juniors) situated at Beattock Street and Powfoot Street. View from beyond the railway bridge in Duke Street with The Forge in the background. Look how this area has deteriorated through 45 years of neglect. New Parkhead ground built on Janefield Street and even overhanging the graveyard. After complaints against the plans from families of those buried there, GCC decided anyway to grant the football club permission to go ahead with their plans for expansion. Ironically part of the ground is closed off most of the season due to lack of attendances. Please leave the bitterness to other websites. Streets of houses sold to adjoining football club for £1, families were rehoused and buildings demolished. Tax payers footed the bill. A G Barr took over this building in 1887. Barr's became known as Scotland's other national drink, Irn-Bru the drink that was advertised as been made from girders. Only part of this tenement remains today, with 'The Old Black Bull' seen on the left of the photo. It certainly is, that's Janefield St running alongside it. Expand this photo to the max and look in the extreme top left hand corner. Is that the Celtic ground ? Definitely Carntyne greyhound stadium, briefly used for speedway. I believe it was used at one time by a local junior club. This aerial picture is of the East End of Glasgow not Pollockshaws.